In this article, we'll discuss DoneDone's plans, pricing, payment options, and how to retrieve invoices. All billing management is controlled by the account owner. DoneDone offers four payment plans: Starter, Pro, Premium, and Max. They differ by the amount of active users and file storage space available. Here's our plans and pricing page for more detail. All plans come with unlimited projects and a 30-day free trial. We accept all major credit cards including Visa, MasterCard, American Express, and Discover. What is an "active user"? An active user is someone who is an account admin (or the account owner) or someone who has access to at least one project. Alternatively, an inactive user is someone who doesn't have access to any projects. We only count active users in our user limits for each plan. By default, DoneDone bills your account monthly. Your first credit card transaction will run 30 days from the day you sign up and then every 30 days afterwards. 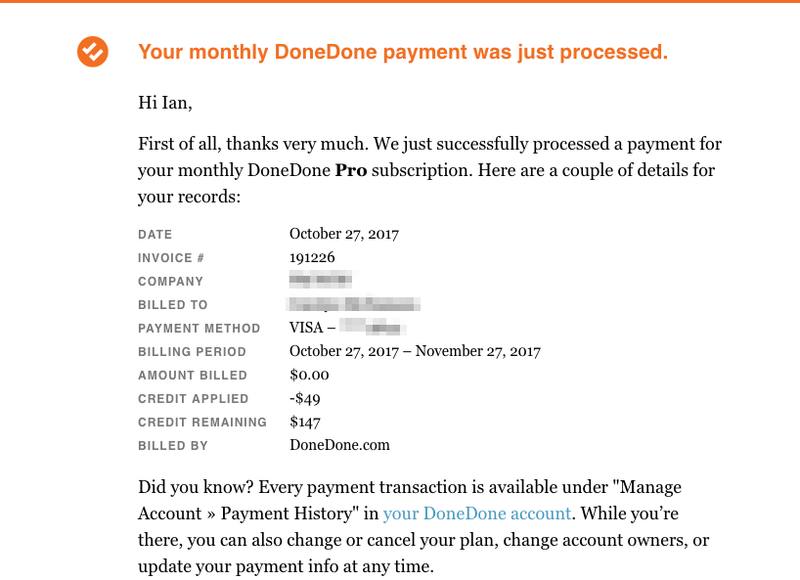 Toward the end of the trial, you'll receive an email reminding you to enter in credit card details to continue using DoneDone. We'll send an email invoice to your billing email address each month. Note: We only accept credit cards for monthly billing. You can also pay for an annual plan. This option lets you pay for 12 months of service on your current plan upfront with an extra 13-month credited to your account. In addition to credit cards, we also will accept check or bank transfer. If you upgrade or downgrade your plan during this time, your credits will simply be used up faster or slower. Plan Name Annual Cost Extra month free? If you're interested in paying annually, send us a note at support@mydonedone.com. We'll simply run the transaction on the card you have on file (unless you opt for a check or bank transfer payment). Every so often, a credit card transaction will be declined. This may be for a number of reasons. If a monthly transaction is declined, don't worry—your account will remain active and an email will be sent to your billing email address. We'll try to process the transaction again every other day for three more times. At any point during this period, the account owner can update their billing information by signing into their account. If there is an outstanding invoice, we'll try to process it immediately with the new credit card information. If the transaction still hasn't processed after the third retry, the account will be suspended and an email will be sent to the billing email address again. At this point, no one will have access to DoneDone besides the account owner. The account owner will only have access to the Billing Information section, where they can update their billing information to reactivate the account. DoneDone will immediately transact the outstanding invoice as soon as the credit card has been submitted, and the account will be instantly reactivated. By default, the billing email address is the same as the account owner's profile email address. However, the account owner can change this. At the bottom of the page, update the billing email address. You will have to re-enter your credit card information to make the update. As an account owner, you can view all of your past invoices and print them for your records. 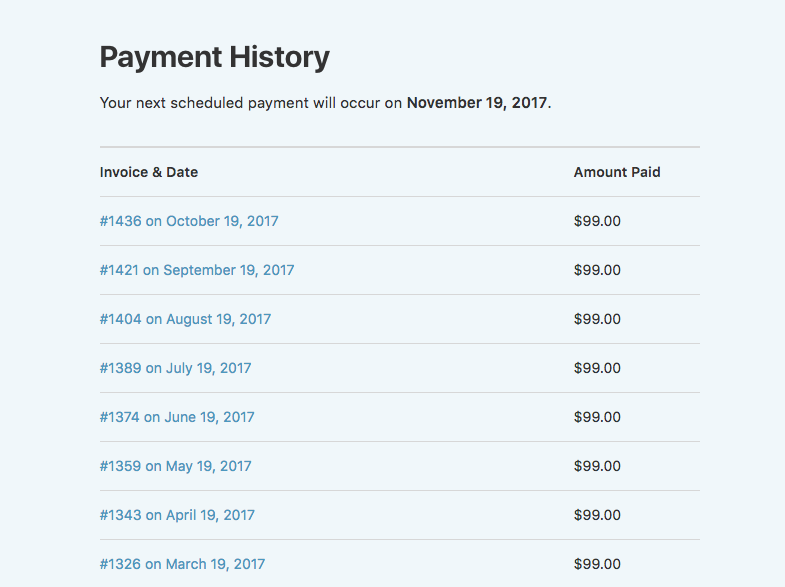 Click the "Payment History" button on the navigation bar. The resulting page will show you a list of all past invoices. You can click on an invoice to view its detail and print.